Before we hit the road from Glenwood, we made a stop at the Glenwood Walmart for some supplies. We did take the time to take some mountain pictures in the beautiful morning light. We saw a good bit of town, and Dad had some good stories about the area from past trips he'd taken. Then he drove us out of town to the west on I-70. It seems like the Glenwood Canyon marks the edge of the most massive of the Rocky Mountains. The mountains west of Glenwood are more spread out, and show more features of the Great Basin Desert (like sagebrush, mostly). The road continues to follow the Colorado River (which has its headwaters, by the way, in Rocky Mountain National Park). We turned north off the interstate in the town of Rifle (Dad liked the name). We went north on CO 13, up to Meeker. This road started out in a dry, rocky desert area with many buttes and formations, but as we approached Meeker we climbed in elevation and entered a greener cattle range. In Meeker we turned west on CO 64. We passed (and stopped at) the Rangely Reservoir, and had a pleasant chat with a local who told us about the local wildlife. This area is hilly desert country once again. Then we picked up US 40 at Dinosaur and took that west towards Utah. This road is high desert, and starts to flatten out. 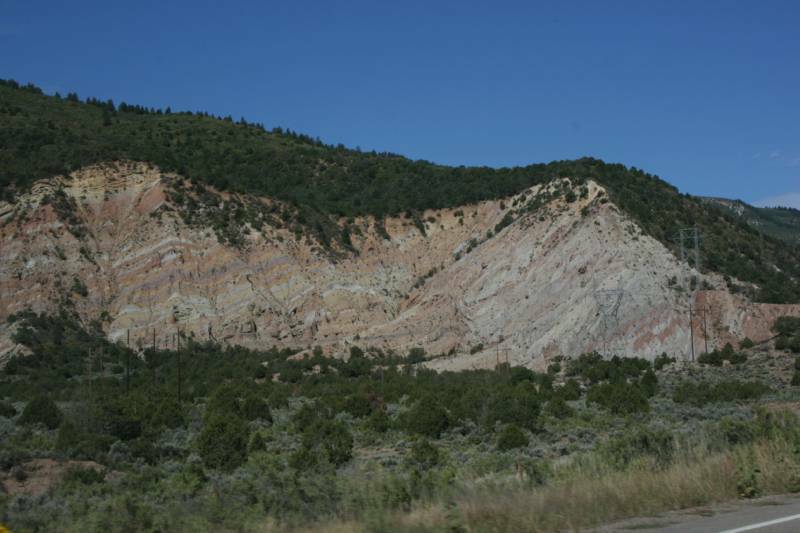 A large, rocky reef parallels this road to the north all the way into Utah (the edge of the Yampa Plateau), and large mountains were visible to the north west. Behind that ridge is Dinosaur National Monument. We didn't stop this time. Our lunch stop was in Vernal, UT. For someone from Pennsylvania, Vernal doesn't quite live up to its name, but the Green River coming through town does make it much greener than the surrounding desert. Vernal is a big town, definitely the biggest we saw all day until we got to Jackson. I took over the drive from Vernal, and we went north on US 191. 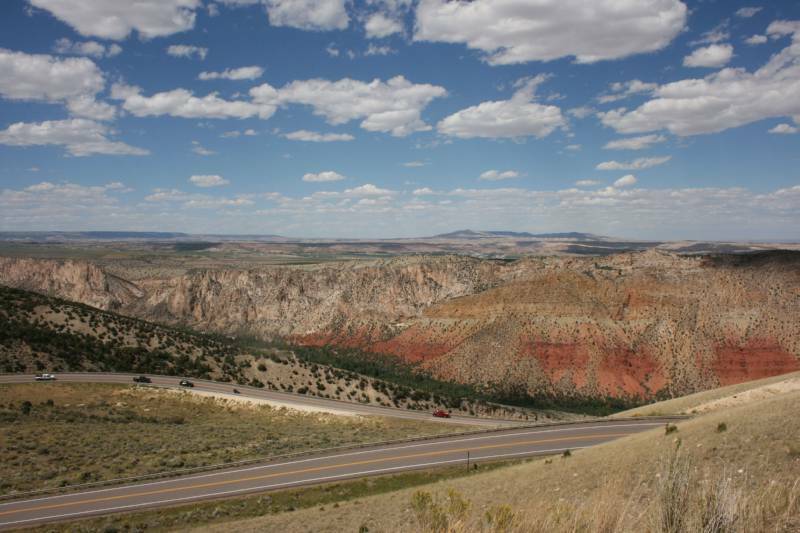 We climbed immediately, passing through a large reef in the Utah badlands, then switching back as we climbed the foothills of the Uinta Mountains. As the road climbs, it passes from the Utah desert to a greener mountain forest. We stopped close to the edge of this, to view the desert from an overlook with some information about local phosphorous mining. 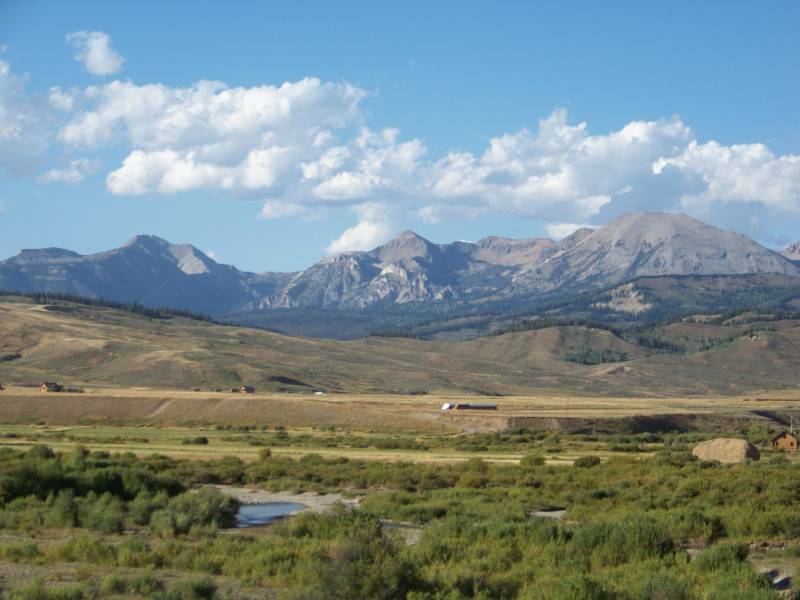 191 passes through the Uintas before arriving in Wyoming, and this area is high, green and rugged. We saw quite a few campers in the thick lodgepole forests, and some cattle as well. 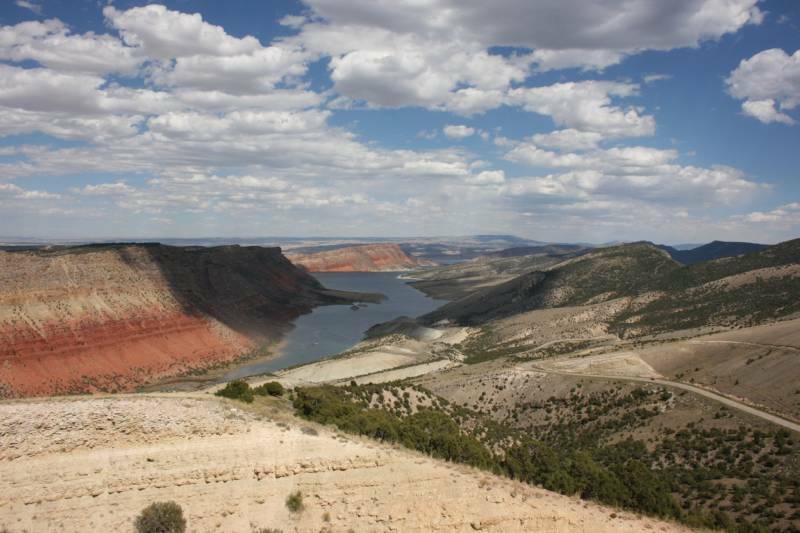 We turned left on UT 44, to see the west side of the Flaming Gorge National Recreation Area, and were glad we did. There's many switchbacks coming down from the Uintas to the gorge, and a nice overlook along the way, from which we took this picture. Off in the far distance we could see Flattop Mountain, and many other buttes and peaks in the Wyoming desert. The Gorge itself is a large lake, full of speedboats and fishermen. Actually, you see quite a few lakes in the west full of speedboats. Once we dropped into the Gorge and started along the river, the terrain flattened out and continued to do so as we went north. We passed a few farms near the Green River, near the town on Manila. Once we passed through there, we paralleled the river on UT 530 to the north. 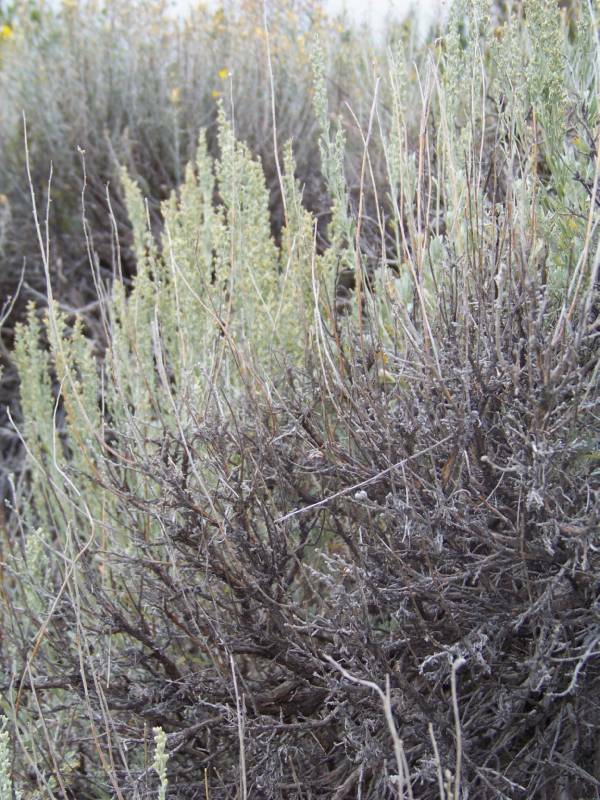 There's nothing but sagebrush, grass, and rocks through here. The speed limit goes up to 70 (on a two-lane road), and there's no reason why you couldn't do 90. There are buttes and formations on the west side of the road here, and the gorge/lake are off to the distance in the east. We saw our first antelope in this section, and found something on the map called the Greater Green River Intergalactic Spaceport. No sign of any spaceships though. 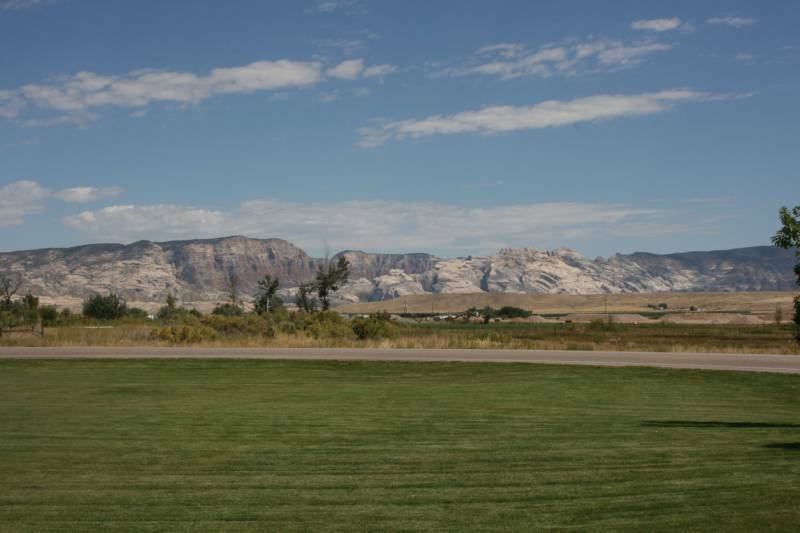 We stopped in Green River, where I-80 passes through, and took the interstate west several exits. The speed limit is 75 here. Then we turned north on UT 372, to US 189. This is a fun stretch of road; it's absolutely barren. The rock formations are gone here, and there is nothing but a flat, desolate plain of sagebrush. You can see the signs of mining off in the distance, and gas and oil wells throughout. We did 80 mph this whole stretch, and you hardly even notice thanks to the openness. 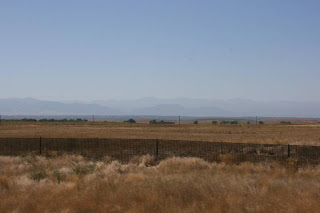 Once we got about to the town of La Barge though, we started to see mountains both to the west and east. There were quite a few large, snowcapped peaks to the northeast, part of the Wind River Range. 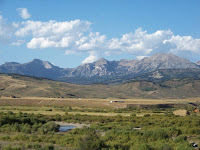 The distances were probably a hundred miles to each, but that range and the Wyoming Range on the west meet in the north, between La Barge and Jackson. Once we passed the Fontenelle Reservoir, we started to notice some badlands as the ground gained elevation. We made a few neat sightings in this section. First, a large wildfire was burning on the back of one of the mountains to the west, and the smoke was noticeable even in the valley we were passing through, thirty miles away. Further north yet, a large thunderstorm was blowing up over the Wyomings. We managed to escape with just a few raindrops, but it was fun to see the cumulonimbus and lightnings on the wide open prairie. We hit US 191 in the town of Daniel, then crossed the headwaters of the Green River and crossed a continental divide into the Snake River basin. 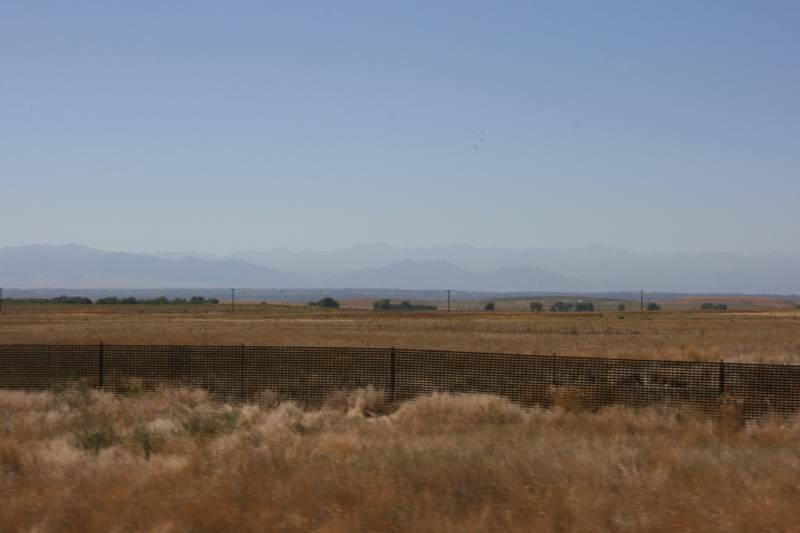 This was a gentle desert pass, with mountains closing to the east and west. As they did, the terrain got greener and greener. Finally we were squeezed into the Hoback River canyon as it dropped towards Jackson Hole. This is quite a tight, high canyon - very scenic. The best part of coming in this way though, is that the Teton Range is entirely hidden the hole time, due to East Gros Ventre butte just to the west of town. In downtown Jackson, we could see the top of Grand Teton itself for just a minute, but we never saw the range at all this day. And instead of going to look, we found our hotel (the El Rancho), ate at the Silver Dollar steakhouse, and called it a night. Quite a day of driving! For stage one, my father and I flew Southwest Airlines from Pittsburgh to Denver, CO, with a layover in Orlando, FL. On the way south, we could see the edge of Hurricane Earl from the jet. Going west, we passed over the Gulf of Mexico, and the presence of oil from the Deepwater Horizon spill was easily discernible in spots even at 30,000 ft. The water had the mottled appearance of a puddle in a parking lot. My brother Danny picked us up at the Denver airport, and we stopped back at his apartment to gather his stuff. Then about 6:00PM, we hit the highway for the first stage of the drive. Dan wanted to travel west on I-70 so we could see a bit of north-eastern Utah. I drove us from his apartment, north on 470 to I-70, then west through the mountains. What a fantastic stretch of road this is! We took it slow for the first twenty miles or so, as there was quite a bit of Labor Day Weekend traffic on the highway, but that cleared out somewhere near the Idaho Springs exit. It was full speed ahead for the climb to the Eisenhower Tunnel, and then more than full speed ahead down the other side. The Eisenhower Tunnel crosses the Continental Divide (separating the Missouri/Mississippi Rivers drainage from the Pacific Ocean drainage of the Colorado River) at over 11,000 feet elevation, which is the highest point in the U.S. Interstate system. Dan's Jeep Liberty had a few acceleration issues at 10,000 ft. and above, and a little jitter as I was standing on the brakes coming down from the pass. I-70 is a great reintroduction to the West when you've been away for a while. We entered the interstate right near the Dakota Hogback ridge, then went up and down mountains right away. We saw one that still had snow on top- we could see that peak from the plane as well. It takes a few miles to start to see mountains with a discernible treeline, but it's not long until the highway itself is close to that treeline. On the eastern side of the divide, the highway follows Clear Creek which is occasionally visible from the highway, and then picks up the Colorado River on the west. There's one tunnel on the highway between Denver and the Divide, as well. Past the Divide, we leveled out at the towns of Dillon and Frisco, which sit on the Dillon Reservoir, surrounded by Rocky Mountains. Next up was the climb to the Vail pass and the ski town of Vail, which seems busy any time of year. The highway runs right through town and past the slopes, which are to the south of the highway. The mountains continued right up to the entrance of the Glenwood Canyon. This is one of the most spectacular parts on I-70, but we got there a bit past dusk, a little too late to fully enjoy it. Nevertheless, it's quite breathtaking. The highway hugs the northern side of the canyon, and travels through several tunnels. There are a number of places in here where the lanes are built overtop of each other, in order to minimize the construction damage to the canyon. There's railroad tracks on the other side of the river, which go through some tunnels as well. At the bottom of the canyon is Glenwood Springs, where we spent the night. We ate at the Glenwood Brewery, and Dan reported that the beer was very good. Then we spent the night at the Glenwood Motor Lodge.